Kelly Hart is your host at greenhomebuilding.com, and has built his own home using a hybrid earthbag/papercrete technique, which can be seen on the Earthbag page. He has adapted the concepts popularized by Nader Khalili and his "superadobe" building, by filling the bags primarily with crushed volcanic rock. This creates insulated walls that are similar to strawbale, except that they are completely impervious to damage from moisture, insects or rodents. The earthbags are plastered both inside and outside with papercrete. Kelly has produced a video, titled Building with Bags: How We Made Our Experimental Earthbag/Papercrete House, which chronicles the adventure of building this house, and shows other earthbag houses as well. Another video program that he produced is A Sampler of Alternative Homes: Approaching Sustainable Architecture, which explores a whole range of building concepts that are earth friendly. One of the homes shown in this video is a hybrid strawbale/wood framed home. Kelly spent many years as a professional remodeler, and is available to answer questions about what he has done, or consult about other hybrid projects. Q: My fiance and I just bought land in northern Maine around the 45th parallel. We do not have a lot of money, and are trying to pay as we go. We intend to build a strawbale/cob structure next year but want to build something over the summer to live in for the winter. What is the most feasible, environmentally friendly, resourceful and inexpensive building style/material for this climate? We are considering cob and wondered what the easiest floor to put in a cob hut is? A: I would suggest that you build your winter quarters with strawbale, which will give you a nice, comfortable place to spend the winter. If you plaster the walls with earthen plaster, and make a rammed earth or adobe floor, then this will also give you some valuable experience for any cobbing you may eventually do. Q: The only trouble with getting straw bale here is that it has to come by the truckload from Canada. It costs substantially more per bale if you do not buy the whole load but we would not need the whole load for such a small project nor can we afford to buy the whole thing and store the excess. How many bales do you think we would need for a small but livable space? We were thinking cob because we have more of the resources readily available and I am a ceramic artist so have experience building vessels out of clay. How hard would it be to build a small, round, maybe 20 feet diameter cob structure? We are scavengers so will be able to collect windows and other materials salvage. I am just worried most about the floor situation because I am pretty sure we would need to dig below the frost line here, which is about 4 feet down. A: The main reason that I suggested strawbale over cob for building in Maine is the comfort factor. Strawbales are insulating and cob isn't, so in a cob building, even a small one, you will have to use a lot more energy to keep warm during the winter. The folks who do a lot of cobbing and have written books about it agree that exterior cob shells work best in temperate climates. It is possible to make a double wall of cob, with two separate layers, and stuff the space in between with some insulation, but this is going to be way more work than stacking a few straw bales. Getting below frost level for a foundation can be done with a rubble trench foundation that goes down that deep. Otherwise, it is not generally necessary to recess a floor below frost level, although if you did you would gain the advantage of all that berming for the structure...but unfortunately neither strawbale nor cob are recommended below grade. Q: I am staying in a hot climate near by the sea and I would like to know if the straw construction can be used in combination with mud blocks? Also, the structure as such, will it withstand the load or can you suggest me some other construction technique that will keep the interior cool. I don't want to dig into the ground as the excavation cost will be too much. A: The combination of strawbales and adobe can indeed create a very comfortable house in your climate. You will want to use the strawbales for the exterior walls for their insulation value, and the adobe for interior walls as thermal mass. With a good foundation and ample roof overhang, your strawbale walls can be plastered with earthen material as well. Strawbale walls can be either load-bearing or not, depending of the design; I have even seen houses that are both. Q: Can you suggest to me what shape of building will be good for excluding the sun's radiation? Since I am using straw construction, can it be curved.? Also I want to know if adobe can be used as a vaulted roof in place of a brick roof? Finally, what will be my wall thickness if I am using straw construction with adobe walls? Will it be economical? A: You might study some of the material presented at http://greenhomebuilding.com/heatwithsun.htm that relates to passive solar architecture for your question about this sort of design. In a hot climate, substantial eaves or porches can protect direct solar gain from the windows. Yes, you can construct a curved wall with strawbales, especially if the curve is fairly gentle, and this can create a strong wall. The wall thickness will be determined by the thickness of the bales themselves, which is usually over 1 foot thick. How economical this will be depends on the cost of these materials in your region. As for the possibility of using adobe bricks for a vaulted roof, this is certainly possible, as has been proven by centuries of Middle Eastern building, but in your circumstance, I would not particularly advise it, for several reasons: 1) Strawbale walls require a substantial eave or roof overhang to adequately protect them from the weather. 2) Adobe will not provide sufficient insulation for the roof area, which is where most of the heat loss or heat gain is experienced in a building. 3) Vaulted adobe roofs are difficult to construct and are vulnerable to water damage, which can cause them to collapse, which can be a safety issue. Q: I want to know what kind of roofing material to use. Can you suggest to me a material that's cheap in construction and also keeps the interior cool? Also should I go for a flat roof or pitched or vaulted roof? A: I would suggest that you go for a pitched roof. Often corrugated metal roofing is fairly inexpensive, and you can insulate this with bags of straw, rice hulls, wool, or fiberglass underneath the metal. Q: I am doing a adobe and strawbale project. Ii was wondering if adobe walls with strawbale insulation on the outside accept glass windows? Also, is it advisable to use glass skylights at the wall and ceiling junctions....will it be structurally safe? A: Strawbale/adobe walls are a good arrangement, with the straw on the outside for insulation and the adobe on the inside for thermal mass. Glass skylight can be difficult to make water-tight, but it can be done. You may need some design help from someone who lives nearby to suggest the best support for such a skylight. Q: I want to know if we can use tyres for the foundation if I am going for a strawbale construction? Or can you suggest me some other cheap material that will hold good in a hot climate? And as I stay near the sea, the soil will be saline? A: Tires have been used as a foundation for strawbale building successfully, and in your situation this might be a good idea. Q: Will there be any need of providing any air conditioning in the rooms when the walls are made of a layer of adobe and strawbale each, with the strawbales on the outside and plastered? A: In most climates, and in a well designed house, air conditioning under those circumstances should not be necessary. Q: Can a house with adobe and strawbale stand on a tyre foundation especially when the front part of the house is elevated? I am sending you a picture of the conceptual sketch of my green house design in which the side and the rear of the house is surrounded by a gutter to take the rain water and empties into the pond in front. The picture has stilts in front. Can I use a tyre foundation and the same in place of the stilts? A: Both adobe and straw require a solid foundation that completely supports the material, is well above the ground to avoid water, and does not wick moisture into the wall. Tyres can certainly do this, and it appears from the photos that you sent that you have a pretty good idea of how to use them. In a situation where water might collect and you want to avoid moisture rising up through the foundation, you might consider filling the tyres with gravel, so the water can drain right back out, and will not be wicked upward. The idea of the wooden sill plate (especially if it is treated to avoid rot) is often used with strawbale building, but I have usually seen it doubled, so that there are two parallel boards that are the width of the strawbales to sit on....and then space between the two boards can be filled with gravel. Q: I have to use a sloped roof depending on the wall materials I am using. What kind of roof material would you suggest? The site I have chosen is in India and it's hot and humid there. A: Often the easiest sort of roof to apply will be corrugated metal, since it is light and durable, and it is easy to extend the roofing to make a substantial eave, which is essential with adobe and straw. It will need to be well insulated from below. Other, more natural materials are also possible, such as thatch, if it is available and if you have the expertise to do it. Q: The options I had in mind are to use terra cotta tiles or green roofs and the one you had suggested (corrugated sheets). But as you know my design involves adobe and strawbale which is natural. I hesitate a bit to now use modern material for roofing. I feel it would kind of reduce the natural feel of the house. And also since my site is in a hot climatic place I was wondering if I could use earthen pots as thermal insulators in the roofing? If yes how can the be installed? A: If you have terra cotta tiles available for a reasonable price, by all means use these. All they take is fairly simple framework to support them...but they are heavy so beware. I am not sure what you mean by earthen pots. Good insulation is usually very light-weight material that traps a lot of air, which is why I suggest straw in bags, or something like this. It seems to me that at this point you have a better idea of what is appropriate for your situation than I, since I cannot know with certainty what to do. Maybe you should find some local person who is experienced in this sort of construction to advise you. Q and A: My question concerns the trade-offs between various natural building methods and how to choose what's best for my particular situation. I'm a 50 year old single woman with some physical disabilities, modest to so-so building skills, and little money -- but a lot of determination! I live in coastal hills of Sonoma County, Northern California, in a forest/grasslands microclimate with 100" of rain from November to May and occasional high winds (e.g., just had a storm with 80 mile winds and 6" rain in one night). Hot and dry summers, with extremely high fire risk. Oh, and just a mile from the San Andreas Fault. I love it here! I lived for many years in Sonoma county, in Jenner, Occidental, and Forestville, so I know the area pretty well...and it is a beautiful place! I plan to build a very simple, one-story, 900'-ish home this spring/summer (and need to move into at least a shell by early fall). I plan to do as much labor myself as possible, draft the occasional friends, consult local building experts for advice, hire a helper as needed, and contract the cement work as must. My friend and strawbale advocate Marty Hammer convinced me that load-bearing strawbale is the only way to go. I've been reading new book "Design of Straw Bale Buildings" (Bruce King, et al), and am now full of doubts about MOISTURE -- in particular, my ability to construct something sound enough to hold up to six months of total wetness. The book is full of great details about dealing with serious rain, but I honestly don't have the skill, nor the money to hire the craftsman/woman to painstakingly ensure every connection and frame. One way to insure a fairly safe building process and ultimately dry walls is to first build a timber frame structure with a good solid roof with substantial eaves or overhangs to protect the walls...then you can infill with the strawbales and do the finish work later without worrying so much about the weather. I'm also conflicted about plastering -- several coats, inside and out, buckets and buckets, mixing and lugging up ladders, the time involved ... I honestly don't think I'm up to it. If nothing else, it definitely is outside of my time limitations. You are right that earthen plasters are a lot of work to apply...something that is best done with a crew, whether pros and not. I've also read "Earthbag Building" (Hunter & Kiffmeyer), and now I've carefully read through Kelly Hart's info here on earthbag building with scoria. Hmmmmm. This may be complete heresy, but here's what I'm thinking: Could I build a post/beam or stick-frame structure as if it were strawbale, but use scoria-filled bags as the in-fill instead? Yes, you could do this, and the building officials might require it anyway (if you intend to have your house permitted...probably a good idea, given the history that I am familiar with in that region). Earthbags don't require post and beam for support, but they are also not common enough for the building officials to be comfortable with their use either... but as infill, it shouldn't concern them much. Earthbags filled with scoria will not rot, nor will they likely have problems with mold. I used papercrete as a plaster for my earthbags, and this is where the concern for mold came in. Could I then use something like fiber-cement panels or planks (Hardie or similar), attached to wood frame, as outside skin? Fire proof (mostly). Do-able for one or two people in short amount of time. This is possible, but you would need to add a bunch more wood framing to attach this siding to. Do I want a vapor barrier, or let it alone to breathe? It is always better to let the wall breath in situations like this. I plan on plain gable metal roof -- 2' overhangs sufficient? or 4' overhangs on a hip roof (as "Design of Strawbale" suggests as best option for my conditions)? 2' overhangs are usually sufficient, but I suppose that these might be longer for a steeper roof design, like a hip roof might be. The amount of overhang should also be carefully designed to be ideal for any passive solar features you intend. And here's my final sin: dry wall interior. It can't be that bad, can it? Again, weighing the time involved in beautiful plaster job, vs my need to get it done and move in, this seems most realistic. You could do a dry wall interior, but again, you would need to add a bunch of interior wood framing to support this, and then go through all of the finish work involved. I don't think you would end up saving any time, and it would cost more to do this. Hanging sheetrock is no fun either. And what you would end up with would not have that natural feeling that I suspect has attracted you to strawbale or earthbags in the first place. Or cover interior walls/ceiling with reed fencing? Cloth? Or? This approach might be the fastest of all, and could be done very artistically. It would be easy to experiment with. BTW, I'm planning on rubble trench foundation (draining to swales) with floating concrete beam. Sounds like an excellent approach. And to even up on the green tally sheet, I am now, and will be in future, totally off grid, solar/wind power, gray water system, with lots and lots of recycled items in construction, from wood to sinks. Q: I am considering a strawbale/cob hybrid house on filled tire foundation in a seismically active zone, and would like to understand better how the walls of such a building could be firmly attached to the foundation, to prevent the entire structure from sliding off during powerful shaking or heaving. A: I would suggest that you simply embed 1/2 inch steel rebar stakes into the tire foundation and into the ground below at intervals that correspond to the length of the bales, leaving maybe 2 feet exposed above the foundation upon which you can impale the first course of bales or cob. You may need to actually drill through some of the tires to accomplish this. The weight of the building will keep it from lifting off the pins. 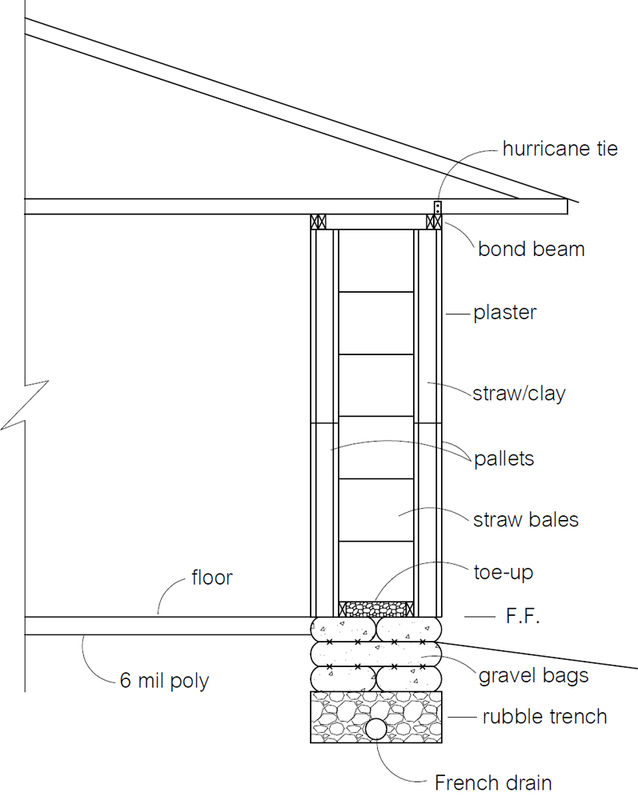 Q: Is it possible to build an earthbag home with a strawbale second floor? Would it still be structurally sound? We would like to have a loft as our bedroom on the second floor and my husband wants to incorporate both earthbag and strawbale building. We were also wondering how to build the roof if it is not a dome? I suppose the roof would be my biggest concern. A: Sure, I see no reason why you couldn't build a 2-story home with earthbags on the first floor and strawbales on the second, as long as the building is properly engineered. The earthbags can certainly support the weight. There are many ways to make roofs, from standard rafters or trusses to ferrocement domes...it all depends on the design of the home. Q: We have spent the last year working on our strawbale/conventional hybrid home. Our engineer who has worked with straw before suggested convention framing with OSB on the outside and notching bales with a chainsaw and sliding them up tight against the OSB then finishing the interior of the bale with natural plasters. This is what we have done. We are about to apply one of our final coats and I have found a problem: we have had a sheetrocking crew mudding our sheetrock (interiors, ceilings etc) and consequently had a huge amount of humidity. We have as possible opened windows but with sub 0 temperatures the last week we can't leave them open long and have the house around 70 deg. I have noticed that in a number of locations that have not yet received mud on the straw if I push my hand through the intersection of 2 bales I can feel the OSB on the inside and it is frosted with about 1/4 inch of ice is my guess. The straw seems to also be a little wet at that outside edge where it meets the OSB. Am I being over concerned that this is a problem or is it going to be just fine? Please help ASAP as I don't want to move forward until I have some definitive answers. A: I know of a house that was built several years ago by an experienced carpenter who did something similar to what you describe, using conventional 2X4 framing and T-111 plywood as exterior sheathing, and then insulated the structure with bales laid on end (the studs were spaced to accommodate the bales). Rather than use an earthen plaster on the inside, he wanted sheetrock, so he had to attach nailers to do this. He was concerned about condensation forming on the exterior sheathing also, just as you have discovered, so he opted to place a plastic moisture barrier on the inside before he attached the sheetrock, rendering the house basically unbreathable, but least he felt this would save the bales. This is a difficult situation, because the conventional wisdom says to keep it all as breathable as possible, but with such a hybrid structure where the exterior is not inherently very breathable, then these sorts of condensation problems can occur and you need to mitigate against this outcome. In your case, where you want the natural plaster inside, placing a moisture barrier there is not so easy, nor am I sure it is the best solution either, since you definitely don't want to trap moisture in the wall. It may be that the best thing in your situation is to go ahead as you plan and pray that it will work out in the end. Normal living in a house produces quite a bit of vapor (from breathing, cooking, bathing, etc.) so there will always be a source of moisture wanting to get through those walls which could condense where it meets the cold outdoor sheathing. A (Owen Geiger): Well, as you've found out you've broken one of the most important principles of strawbale building -- one of the big things harped on over and over in all the literature -- that moisture must be able to pass through the strawbale walls. There is some leeway in the system if you live in a dry climate, use high quality vents and vent moisture at the source (especially a range hood in the kitchen and bath vents). A dehumidifier during construction would have been a good investment. Building during the summer to speed drying would have been best. I don't know all your climate details, but sorry to say it's likely you are at high risk of moisture damage with few good choices. Q: Is there anyway I could contact Joe Michalak from Colorado who did the strawbale in-fill. All the information I read says to encapsulate straw with cob so it can breath and resist fire; however Joe used woodchip board exterior and sheetrock interior. I wanted to ask him if these manufactured products can breath also or if he even considered this? A : Joe used a vapor barrier on the INSIDE to keep condensation from being in a problem in his walls, because they do Not breath. Q: My wife and I are building an all wood home in Vermont. The walls will be constructed of three sandwiched 1x6 boards running vertically three feet apart. These 'beams' will be exposed on the inside. Outside of them will be 1x8 tongue and groove running horizontally up the wall. There will be rigid foam on the outside of the 1x8 for insulation purposes and then vertical ship lap boards outside this. My interest is closing in the space and creating a flat wall on the inside instead of a series of hollows between the 'beams'. Would this be possible using straw in the hollow and then plastering over the inside wall? A: I know somebody in Colorado who used strawbales inside a wood-framed and clad building, and it worked out fairly well. He carefully framed the structure so that strawbales fit perfectly between the studs. He also had to put a moisture/vapor barrier on the inside before plastering (he actually used sheetrock), so that condensation would not form within the straw. Q: This regards straw bale with a wooden frame construction. I know usually you use 2x4 16" o/c for frame construction (platform construction). When using straw bale would you use the same (2x4 16'' o/c)? Or would you spread out the 2x4's wider to accommodate the large bales? A: Strawbale buildings can be either load bearing (in which case there is no other wood frame component, other than box beams for the doors, windows and the bond beam) or non-load bearing (in which case the most common structure is post and beam with the strawbales as infill.) Another approach involved spacing 2" X material at intervals to accommodate the bales as insulation, but this has some tricky aspects to it that require very careful interior moisture barriers to avoid condensation problems. Q: We want to build a straw bale home with pallets on both sides, the thought is to put up the straw bales, then put on earth/clay/mud on the bales as we put the mud on we will put a pallet up against the mud on each side and finish the wall, then once the mud is dry put adobe mud with straw in it inside the pallets this would create a very thick insulated wall. Would this be sturdy enough to hold two story? A: (Owen Geiger) I like your idea very much. It will work for your purpose. One suggestion is to lay lengths of baling twine between the bales as you stack them and then later tie to the pallets. This will add a lot of strength. Be sure to raise the bales well off the ground away from snow and rain on gravel filled earthbags, etc. And you'll want to build a bond beam along the top to tie the whole structure together. If you do everything correctly, then I believe a 2nd story is possible, but only with careful workmanship and working out the details. I went ahead and drew a wall section drawing. It may not be exactly what you want, but it's one possible solution. Q : We are working on a hybrid of ideas for a building ... a house with one back room 16' in diameter circle two stories tall, the first level back wall built mostly into the hillside, so we figure to ram earth tires till grade or just above, then earthbag, superadobe to reach proper levels to put strawbale on top. My question arises with the bond beam between the first and second floor and the roof; it is a load-bearing bale house ... ideas we have: 1. poured concrete bond beam (lots of money and not that ecological by our terms, 2. superadobe earthbag (strong enough?) 3. a re-salvaged welded metal I beam (too much?) any thoughts also in the back wall we wish to build a root cellar into the wall tries, ok ? A : It sounds like you have an interesting project. I have several thoughts about what you describe. First, I wonder why bother with pounding all of those tires when earthbags would do the same job much easier? You can bury an earthbag wall just as well as a tire wall, especially when the wall is curved, as yours will be. You just need to bring the wall up high enough to be above grade to begin your strawbales. In this instance, I don't think there is a need for a bond beam...unless you are dealing with code officials who might have other ideas. The barbed wire between courses of bags acts much the same as a bond beam. I did something similar in my house, where the first floor is completely bermed on the north side; I simply made a skirt of 2 layers of 6 mil polypropylene draped over the back of the bags before backfilling. You might want to insulate with blue board or something back there, if you don't fill the bags with crushed volcanic rock as I did. To make an entrance into the pantry, using bags would be easier than tires because you can easily make an arch with the bags over the entrance, and making half bags is probably easier than making wooden fill blocks for half tires. For the second floor, you could start stacking the bales right on the earthbags once you have an even bag surface above the joists. If it were me, I'd just continue the wall with bags, since it might be easier than making a circle with bales, but I'm partial to that technology. You will want some sort of bond beam at the top of the bale wall, which is usually done with wood planks, but isn't so easy with a circular building. Probably a poured beam with rebar and cement would be the easiest. I wouldn't rely on superadobe for a bond beam in this application. Salvaged metal might work, but it would be hard to get enough surface to not sink into the bales. Again, if you went the whole way with bags, you wouldn't need the bond beam. Q : I have yet another question, and I know you suggest the earth bags all the way up but if I did stack bales on top of the bags would the bags act to wick up water into the bales? Also a man out in New Mexico was using recycled latex paint mixed with organic blown insulation to a paste consistency and was using this painted on a bale roof and till this point no problem... I want to say at least one year if not three. He actually mudded it like it was mortar. What are your thoughts on this as waterproofing if any? And also there is an earthbag house in Colorado they call the beehive that is having problems with the earthbags in the foundation leaking water. You have no such problem because of the liner eh? A : Earthbags used as a foundation for strawbales are usually filled with gravel, which does not wick water. Other earthen materials might wick some water, but you can stop this by simply putting a moisture barrier between the bags and the bales. The problem with waterproofing strawbales is that it stops them from breathing, which is generally essential to assure that the bales stay dry. Any moisture barrier runs the risk of creating a surface where moisture can condense from the inside. Using bales as a roof is very difficult for this reason. I don't believe I am familiar with this beehive house. I haven't had problems with leaks in mine. The only place I used the plastic liner was where I bermed soil up against the bags, otherwise my house is completely breathable. With the papercrete plaster, the water never has a chance to find its way through the bags, at least in my climate. Without knowing the specifics of the problem you spoke of, I wouldn't know what to say about it. Q : I was also pleased to hear about your passive solar performance. I would like to have enough windows for light and passive solar, but blending in to my environment is important to me (one reason for my berming low into a hill), and huge banks of windows are hard to do that with. I have seen various"formulas" for determining the proper amount of window square footage for passive solar, ranging from 10% (of floor square footage) to 20% (and the 40% as you mention). Do you have any idea what you ended up with? A : A quick guess is about 30%. The colder the climate, the more you need. Q : Also, I was intrigued by your scoria there again. The naturalhouse.com guy isn't too hot about strawbale homes, claiming they lack the thermal mass for effective passive solar. You talk about your scoria having insulation qualities comparable to strawbale, but you obviously have sufficient thermal mass as well. Maybe it is that air space in scoria again--good for the insulation, but still plenty of igneous rock mass for thermal mass. A : I wouldn't expect much thermal mass from the scoria. My mass is in the flagstone and adobe floor, and in portions of the house where the earthbags were filled with the sand. Whenever I could isolate these bags of sand in the walls, I did so. For instance, the first two or three feet of the bermed wall is made with bags of sand, and then this is insulated with more scoria on the outside, before it was backfilled. Also the entire landing from the main entrance to the house is created with bags of sand. Most of the internal papercrete plaster has a lot of sand in it also. Q: I'm looking at buying a half-built earthship and have a couple questions. The site has 3 U's with about 5 ft. of tires, pounded with earth. Could you finish the rest with strawbale, 3-4 bales of straw? A: You could certainly do this as long as the strawbales are completely above grade (not bermed). 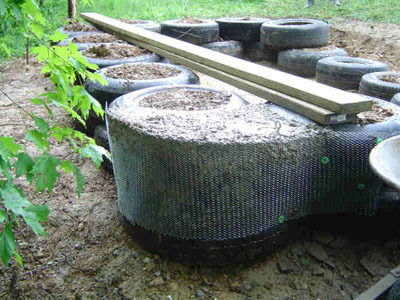 Tires have been used many times as a foundation for strawbale structures. We're thinking about pounding rebar in and putting strawbales over the rebar. Would that be enough to support the roof or would you also want to add corner posts. Also the U's are not very curved so I'm a little concerned about the support of the berm on the north wall. Could this be solved by not building up the north berm as much? Yes, although it doesn't take much of a curve of the tires to be very stable. If you decide to complete the walls with strawbales, then you wouldn't be berming up above them anyway. If we increased the curve on the next couple of tire courses would that help? I suggest that you keep the curve of the wall consistent and keep the walls vertical. Q: My question is whether or not strawbale would make an economical and practical inner wall (and insulation) with load bearing stone walls (either traditional or slipform)as outer walls...would the inherent condensation from the stone walls endanger the strawbales? Would a 1/2 inch space mitigate this danger, and have you ever seen this method used? A: No, I haven't heard of this particular approach to building a wall. Your concern about condensation forming between the materials could be justified, since the cold rocks would tend to make this happen. An interior vapor barrier may be necessary. Trying to leave a small space between the rocks and straw might be difficult to achieve, given the unevenness of the materials. I always advocate putting the insulation material (straw) on the outside of the building envelope, with the thermal mass (rock) on the inside. If the straw had a somewhat breathable plaster on the outside, I don't think that condensation would be a problem with this arrangement, because the rocks would not get cold enough. Q: Can anyone tell me if it is possible to build a strawbale home and slipform the front w/stone? I have searched through many book options, but I would really like to marry the two concepts I love, stone and strawbale, and would love to utilize as much of natural resources as possible. Would the stone be an option instead of stucco? A: My recommendation would be to reverse the order and put the stone on the inside so that it will act as thermal mass in the house, with the strawbale insulating it. In this way you would also eliminate the potential problem of condensation affecting the straw. Put a breathable plaster on the straw and you will have an extremely efficient house that will last a very long time. In this way, I don't think that you need any gap between the stone and the straw. A: (Owen Geiger) Stone/straw combo is not common and seldom discussed, so there's little if any body of knowledge to draw from. My guess is it's similar to wood siding. I think a small 1/2" gap between the stone and bales would allow moisture to escape/drain. One obvious drawback to this idea is it creates excessively massive walls. Q: I am interested in building a stone house. I have questions about what the cost will be. We have the cement mixer, and land- but probably not enough stone. I would like the house to have a full basement- out of cement possibly but was hoping something natural like strawbale might work. I was thinking that I could set the ground level outside the perimeter of the basement level to avoid the added stress of the structure. However, we will only be able to hire out for less than 1/2 the work. I wanted to basically do a 2 story house w/ basement with at least 3 bathrooms. Strawbales are not suitable for any basement construction; they are too vulnerable to eventual rot. But they are great for a well-insulated shell of an above-ground home. My suggestion would be to design your home with concrete or stonework for the basement, and do the first floor with strawbale. Some interior stonework on the first floor will provide needed thermal mass to keep the home comfortable. That makes sense for the basement. Also for the first and second floor- straw bale for an interior as an insulator will work? Keep everything warm... Is 3500 sq feet feasible - structure wise? I would like it to be 2 story. My concern from what I've read so far is that the further up you go the structure becomes a problem. Will straw bale on both levels be a strong enough support? Also, is there a way to "fire/ moisture" proof the straw bale interior? I was picturing just the basement with one story above that when I suggested the strawbale upper portion. Strawbale building rarely goes above one story. My idea was that the basement would provide the foundation for the upper story. The strawbale would ideally be exterior, since this is where you need the insulation. Stonework would be on the inside. But if you want a basement plus two stories, then the first story should probably also be stone, although any exposed stone building needs some form of insulation to make it comfortable. This can be accomplished with an interior core of insulation sandwiched between two layers of stone...a very time-consuming and likely expensive project, especially for a house as large as you want. Anyway you look at it, you would be embarking on a MAJOR project. Strawbales are surprisingly fireproof, because of lack of oxygen in the bales, but then they can be made even more fireproof by plastering them with an earthen plaster. Q: Would there be sufficient insulation if I were to use a solid stone wall (exterior), then straw-hay (middle layer for insulation) and the light-weight concrete for the inside finishing touch? A: You might be able to do what you describe, but I have a few concerns: 1) The wall would be very thick. 2) You need to make sure that the strawbales can breathe, so an air gap between them and the stones would be a good idea. 3) Lightweight concrete does not provide as good thermal mass as stone, or even earthen plaster would...and you want plenty of thermal mass on the inside. An ideal hybrid wall system would be strawbale on the outside for insulation, and stone on the inside for mass. Or, another approach would be to create a double stone wall with insulation in between. Even though commercial rigid insulation is not as green a material as straw, if I were designing your wall, I would think about embedding several inches of this material between two layers of stone, and end up with a beautiful and thermally efficient building. Q: I have a load-bearing strawbale house with a stem wall made of gravel filled polypropylene bags. I'm planning on covering the bags with flag stone mortared together with lime mortar. My question is will the mortar wick moisture into the bales and should the rocks just sit on the ground or do I need to put something under them like gravel. A: The bags should do fine with mortared stone up against them. If the stone also makes contact with the bales, I suggest providing some means for air to circulate between the two, using wire mesh or something to keep them apart. The stonework should probably have some foundation other than just the soil, and a small rubble trench should suffice for this, to keep the soil from heaving when frozen. Q: I intend to build a hybrid house; basically it would be an earthen cellar (used as such), dug into a hill, in front of which a small dwelling would be constructed. The front part (south facing, front wall exposed) would be build of stone in the lower part and glass in the upper part. The whole structure would be covered with a green roof, used for gathering rain water. My main concern is proper insulation and construction material for the external underground walls and floor as well as the roof. The dividing wall between the earthen cellar and the dwelling would be a massive straw bale wall with clay finishing. I live in an area with four distinct seasons, spring and fall being quite wet with relatively high temperature oscillations, winters cold with snowfall and summers hot with frequent showers and storms. Temperatures vary from -15C to +35C. I would like to avoid using conventional construction materials if at all possible. A: Basically it sounds like a good design that you have in mind. I recommend using materials underground that cannot be adversely effected by moisture, such as masonry materials. One such material that is also insulating is volcanic stone, which can be used in a crushed form packed into earthbags or made into pumicecrete. Otherwise, you will probably need to use some other commercial insulation product to insulate stone walls, or whatever you decide to use. This can be as little as 1.5 - 2 inches of rigid insulation. As for your roof, I think you will need to decide if you really want a green roof, or do water catchment, since the two cannot be done effectively together. With water catchment you need a roof that will not impart any toxins or shed organic material. Metal roofing and clay tiles have been used effectively for this. Such a roof can be fairly lightweight in structure, and insulated with bags of rice hulls, straw, etc. from below. A true green roof requires much more substantial support, and needs to be engineered to handle all of that weight. This usually means using very hefty wood or steel beams, or reinforced concrete. Q: I plan on building a hybrid building (straw, earthbag and cordwood). This building will consist of an inner circular tower that will be 2 stories and capped by an earthen roof. This tower will be built using cordwood construction. The outer circle will serve as the first floor and be a post and beam framework with straw bale infill; this will also be capped with an earthen roof. My question is, is it safe to lay down a bed of sand (6-12 inches deep) and lay down earthbags as starter walls for the inner and outer circles? And what is the best way to fasten the posts to the earthbags? A: You didn't say where you are building, what the climate is like, and what the natural soil is at the site. I built my earthbag house on a huge sand dune, with no foundation other than the earthbags themselves. Sand drains nicely and compacts instantly, both of which are good traits for building upon. It also can shift and blow and move around with currents of water, so it needs to be contained somehow. The big question is frost upheaval with foundations, since you don't want the structure moving up and down if the ground under it freezes. My house is built upon several yards of sand which drains well enough that frost upheaval has not been a problem. If, on the other hand, the soil you put the sand over holds water and the frost depth in the winter goes below your layer of sand, then upheaval could be a problem. One way to avoid this is to make a rubble trench foundation down to the frost depth, and then begin building with earthbags on this, filling the first course or so with gravel, so there is no way for water to wick up into the strawbales. The inner tower could be built right on the sand, since there would be no danger of freezing inside the outer perimeter. Q: I am planning on building a cordwood and strawbale home using an earth bag foundation. I helped my neighbors down the road build their strawbale home on a earthbag foundation set on a pad of sand. My two big questions are how would I anchor the post to my building to the bags so that the house isn't lifted up by our strong winds? A: I suggest that you not try to anchor the posts to the earthbags, but anchor them to conventional concrete piers instead, and then create the rest of the foundation as an infill to this. That way there is no question about settling or uplifting. Q: How important is it to cover the bags with mortar? I realize the importance of covering the bags (polypro) to prevent ultraviolet deterioration, however in my plans the outside will be insulated with foam boards. Keep in mind that the foundation I'm attempting is simply a 16 by 18 foot rectangle three courses high. I will cover the insulation with a lime plaster. My big question is if by not covering the bags with plaster am I sacrificing strength? A: The strength of the earthbags as a foundation under compression does not rely on the plaster, so as long as the bags are ultimately covered to protect them from the sunlight, this should be fine. It may be necessary to temporarily cover them with a tarp until they get covered, though. Q: Could you use Kelly's double earthbag wall ideas to build a cordwood home for the foundation and for the earthsheltered parts of the structure - have the front (south facing) side of the home bermed two feet. My thinking is that the cordwood makes a great bond beam for the above ground sections of wall. You could even put a buried earthbag dome pantry behind the north end of the house ( like the one in Kelly's home). This would save on cement ( which contributes to greenhouse gases)- Insulation on the north side of the bermed wall would add greatly to the thermal mass. A: There is no reason why this concept shouldn't work. Many strawbale homes have been built recently using earthbag foundations. They are a natural for situations with earth contact, whether as a foundation or as a bermed wall. There would probably be no advantage to the double wall concept, though, since an insulated single wall should work just fine. I would not rely on cordwood masonry to create a "bond beam"; a better approach would be to actually pour a concrete bond beam on top of the earthbags, and then start laying the courses of cordwood above this. If you fill the bags with crushed volcanic rock, as I did, you would not be adding much mass, but this is where the double-bag wall idea can excel, if the inside is soil and the outside is insulating. Q: I live in Michigan in a manufactured home with a crawl space (rough guess - 1200 square feet). It currently has aluminum siding. We lose a lot of heat each winter and have wondered about 'wrapping' our home with some kind of alternative technique. We cannot afford to rebuild a more efficient home and are trying to make the best of what we have. We have concerns of both keeping 'green' and keeping costs low. Straw and cordwood are both resources that are available here, probably others (earth?). Which, if any, of these would work for this idea of an external 'wrap' and is this an option worth exploring? A: Yes, wrapping your house with either cordwood or strawbales would make a huge difference in the comfort of your home. That metal siding is constantly wicking heat out of your home. Structurally, there are two main factors to consider: you might have to re-roof the home to make the eaves large enough to cover the wood or straw, and you will need some additional foundation to support the new walls and get them off the ground. The foundation could just be a simple rubble trench with earthbags of gravel above that. Detailing around doors and windows would need to be carefully figured out as well...but all of this is possible. Strawbales likely provide a little better insulation and stack faster, but then they take a fair amount of time to plaster. Cordwood takes a little longer to do, but then once you reach the top, you are done...there is no need for further plastering or significant maintenance over time. Q: I want to build a permanent tipi using tamerack poles. Could I cover the poles inside & out with chicken wire, sandwiching flakes of straw in between, & plaster the whole thing with papercrete? A: This seems like an interesting idea that might well work, especially if you live in a relatively arid region. The main concern would be moisture possibly wicking through to the inside. I know of straw bales being successfully plastered with papercrete, so this should work. I would suggest that you make sure that the straw is thoroughly stuffed between the wire and poles, so that at no place is the papercrete solid from inside to out. If you try this and moisture does seem to be wicking through, you could try to seal the exterior papercrete with something, but this is not always easy to do. This would be an experiment... but one worth trying. Let me know how it works out. Q: Hello, what a great site... I am currently working with an architect and have just gotten out of Peace Corps. I want to start building a house in Austin Texas and am wondering if building it with steel construction and straw bale is a good way... I haven't really seen or heard of this yet and am wondering what you thought about it. This will be my first house to build and am going to become a general contractor and an architect in the future. A: I would encourage you to try this out, since most strawbale homes still use a lot of lumber (only about 20% less than the typical wood-framed house) and using steel for framing could save some trees. The trick to successfully combining these materials would be in making sure that such details as eliminating any thermal bridges of steel from the inside to the outside, or any possibility of condensation forming on the steel that could accumulate in the straw. Another possible problem could be differences of expansion and contraction where plasters might crack. Placing all of the steel toward the interior of the building might solve some of these concerns. Q: I would like an opinion/thoughts on using strawbales as an insulation product for a standard Sheet Metal Covered Pole Building. After "stacking and packing" the straw, build perlin structure on the inside that could be covered with sheet metal/Sheet Rock, depending the application. I am sure there are "goods and bads" to doing this. A: When you make a hybrid building combining straw with non-permeable materials like steel you risk lots of problems related to moisture through condensation or lack of breathability...and this depends to some extent on your climate. With straw it is better to keep the wall system breathable. That makes complete sense. I was worried that all the air leaks of a metal structure would loose R Value. You bring another very good point that since the metal would provide rapid changes in temperature due to the weather, the metal would sweat, generating moisture, possibly mold, and other issues. Q: I have this old metal warehouse, 24x30, that I want to use a bale wall inside, with earthen stucco. I am worried about bugs and critters getting in from the outside. A: A steel building is generally impervious to critters, so as long as all of the joints are tight I don't think you need to worry. A greater concern might be condensation forming between the bales and the steel if you live in a cold climate. Ordinarily you want bale walls to remain breathable to avoid this problem. You might possibly place a vapor barrier between the stucco and the bales, but this can be tricky to fully accomplish. Q: I have a metal building that I want to insulate. Can I use a straw clay insulation on the inside right up against the metal? A: The problem that I can foresee with this is that if the metal gets cold (which it will if it is exposed to the outside air) then moisture will likely condense on the inside between the straw and the metal. This moisture then might tend to rot the straw over time. This might be avoided either by also insulating the outside of the building so the metal stays warmer, or somehow placing a continuous moisture barrier over the straw on the inside so that the inside air can't reach the metal...but this is hard to reliably achieve, and it might aggravate the problem of moisture and straw since then the interior wall is completely unbreathable. Q: I live on an island off the east coast of Canada, Prince Edward Island and am seriously thinking of creating a straw/hay bale, 3 sided "indoor" 20' X 40' riding arena, where the "open" side would be facing south. I am thinking both the "open" side and the roof could be heavy gauge plastic on some sort of framework and the entire structure built around a wooden frame, realizing both the bales and plastic would have to be replaced on a regular basis. I am wondering if you have any suggestions or guidance in particular for the roof? Would you use a wooden frame or one of those tubular metal frames? A: (Kelly) It depends on the exact design what the best framing material is. If you are using plastic sheeting, then you need to design it so that the roof doesn't collect water in pools, so a dome or vault shape using metal or plastic tubing might work. If you make the roof with roofing panels, like corrugated plastic, then I would use wood framing, as it is easier to make the attachments. Wondering what you think of using the cattle wire as shown at www.peakprosperity.com in a dome shape? I think that would be perfect. You could even drape the plastic down over the strawbale walls to keep water from soaking them and they will last much longer. Q: I’m interested in the idea of combining steel containers with straw bale insulation, mostly because steel containers as structural components seem to be less expensive and less complicated to implement than timber framing—but has anyone done this successfully and had it for enough years to show that the moisture issue can be overcome? And if so, how? I live in the BC Interior where it is moderately cold and wet a good portion of the year. I have also, btw, lived in a steel container surrounded by unadobed bales but it was in the Mojave desert and I tore the whole thing apart after a year, so permanence wasn’t an issue; in fact the impermanence was desired. A: (Kelly) As I'm sure you know, strawbales should ideally be able to breathe from both sides. If they are up against a steel container this would be compromised, so that they could only breathe on the outside really. The only way that I could see this working in your climate would be to clad the bales with a "rainscreen" between the siding and the bales which allows air to circular between them. Also, some sort of roof that positively sheds all water well away from the structure would be necessary. I have never heard of anybody doing this, but it might have been done. Q: I want to insulate the exterior of an old cinder block garage that's now a living space (too narrow for interior insulation): straw? earthbag? other? Also needs to be something a 62 y.o. woman can handle! A: Both strawbales and earthbags filled with insulating material (crushed volcanic rock, rice hulls, perlite) would conceivably do the job for you. Strawbales would need to be set on their own foundation; earthbags could perhaps be put on the ground if the fill is not vulnerable to rot. Then either of these would also need to be protected by an overhanging roof, and the details around doors and windows can be tricky. A simpler approach might be use conventional rigid insulation (like blueboard) attached to the wall and then protected with a stucco or something. Q: I saw once that someone had put strawbales on the inside of a cement block structure. Could this be done to a brick building? A: I have also seen strawbales combined with cement block, but what I saw had the straw on the outside, which is a much better way to do it, to preserve space inside and to insulate the cement thermal mass on the inside. There is no reason why this couldn't done with bricks as well. You might need to extend the roof some to protect the new wall, and provide an adequate raised foundation for the straw. Q: I'm thinking of building a 30' earthbag yurt style home in northern Maine, with a plywood roof and then covering the whole thing with 6 mil plastic and straw bale on top for insulation. You talk of the walls being able to breath, what do you think? A: In general, what you describe sounds like a reasonable plan. The strawbale roof should give you plenty of insulation up there, but you will need to keep the straw dry for it to be effective and last over time. Also, in your climate you will want the walls to be insulated, so that may affect what you decide to fill the bags with. I filled mine with a crushed volcanic rock, but other alternatives might be perlite or rice hulls...or you can fill the bags with your local soil and then insulate the outside of the walls some other way. Q: I know that the straw will break down over time and I'm willing to live with that. My idea was to cover the whole house with a 6 mil plastic roof and earth bags and then with straw bales for insulation. The idea came from the old Indian earth lodge's and from trying to keep costs down. Can you give me any more options other then plaster for covering the earth bags if I were to use conventional insulation? A: My suggestion that you keep the straw dry is partly for your own comfort, in addition to the longevity of the roof...wet straw will not provide much insulation. You might consider layering the roof with plastic-straw-plastic-straw to maintain some real insulation. Another option for an insulated earthbag wall is to actually create a double wall, with a space between the two columns of bags, which can either be left as an air void, or filled with some other insulative material, such as straw, cellulose, vermiculite, wool, cotton, rice hulls, etc. Q: StrawBale construction in Alabama (surrounded by farmers) seems like a very affordable technique. Has anyone combined this with Shotcrete? The strawbale makes for a nice permanent form, with shotcrete applied to both sides. Gaps in the bales can allow rebar connections and additional crete supports with thick caps for flooring support. Any concerns, references, or advice for this mixture of techniques? A: Actually I have heard of people doing something like this. There is a fellow in Canada who has been manufacturing Strawbale SIPs (Structural Insulated Panels) using bales with cement stucco. His website is http://www.genxsystems.com/strawbale.htm and there is more information about a specific plan that utilizes these at http://dreamgreenhomes.com/plans/sbsip.htm . One thing that I might caution you about is that the general consensus among strawbale builders is that the bale walls are much more likely to survive over time if they have breathable skins. Shotcrete is typically rather high in cement content, which tends to render a rather waterproof membrane, so this could be a problem. A weaker mix might make a more breathable wall. The problem is that if moisture enters the wall for any reason (leaks, poor design, condensation, etc.) then it cannot dissipate, and the straw may rot. Q: I am considering building a timber frame house with straw bale wrap. I've been thinking of a earthbag vault roof. I like your idea of the light weight volcanic rock filling. My question is do you know any source(s) for this type of roof design and do you have any personal input in this design. A: In general, your design concept sounds nice, but I would caution you against the use of earthbags for a vault...they do not perform well in this configuration. I made an 8 ft. span vault with earthbags filled with scoria, and I feel that this was pushing the limit of their capacity. A denser, more solid material will perform better in spanning larger distances with a vault. Q: What would you recommend for the arch material? I prefer a self-supporting roof. Any ideas? Do you think cob would work or am I going to have to go to the (non-green) light weight concrete, maybe pumicecrete? I know the Auroville Earth Institue builds this type of roof using adobe type bricks. A: Nader Khalili made houses using earthbags up to the roof level, and then switching to adobe blocks to complete vaulted roofs over them; I think the vaults spanned about 16' at the most. Cob could probably be used also, but it may require a form under it, because the cob is moist when applied and can slump with gravity. Then there is the whole question of insulating the roof and how to accomplish this. Poured lightweight concrete with some steel reinforcing does have some advantages. Q: We live in a Pan Abode log house. I have been having a great deal of trouble finding out how to improve its acoustic and insulative aspects, and its rain resistance (which is lousy). The company itself will naturally swear that log houses are fine in all aspects, but they aren't, at least not in this climate of Nova Scotia. I know we will need much wider roof overhangs. My quandary is, how to effectively apply bales, or even earth bags (which may be the better choice because of wind-driven rain here) to the exterior, without eventually running into trouble with moisture infiltrating into the bales from the interior of the house, through the logs, which are only 3 inches thick (I understand what is needed for plastering the exterior). I have read some of your replies about coating the side of a bale that is in contact with siding of various homes, but my worry is about this coating, that would be against the exterior log wall surface, being able to dry out properly after installation. Would it work to give a coat of lime/clay plaster to the exterior of the log walls, let it dry, and then place the bales against that surface? Would moisture transference from interior to exterior still be able to occur? If I were to end up using earth bags, which I prefer to avoid because they are so heavy, there is still the fact that the polypropylene is against the log walls and would likely interfere with moisture transference. I want to maintain the internal acoustic properties that the logs have (not using insulation on the interior) because live music played inside is amazing. A: (Owen Geiger) I recommend using earthbags for rainy/humid regions such as yours. Sooner or later water will find a way through and cause problems with straw. 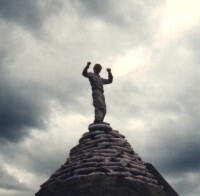 Consider using a lightweight fill material such as scoria, pumice, vermiculite, etc. There's no need to do lots of laborious tamping this way. In other words you're adding insulation, not a load bearing structure. It can go on the exterior so the interior living space is unaffected. You'll need a foundation under the earthbags. Consider a rubble trench. Then simply tie the bags to nails on the logs. Problem solved. transference moving from the interior of the house through the logs? I recommend good fans in the kitchen and baths that exhaust moist air to the exterior (not the attic). Then you should be fine. Q: My wife and I are building a residence with old 40' Conex-shipping containers (4) that will be raised three feet above ground resting on (old) steel I-beams at each end. We are thinking of strawbale exterior with plaster surface. The goal is to have R-60 insulation and to use low cost materials that will last. How best should we attach the bales to the containers? How many bales will we need for R-60? Another need is for an engineer that can assist us with getting our foundation plan stamped so we can start. We are in Eastern Washington state. Our end goal is to have a Net Zero, off grid house built with ISBU structure, SIP roof, and S.B. exterior. The solar, wind and Bio-diesel generator will power the electrical. Solar, wood and geo will allow for active radiant floor heat. Passive heat will be from green house floor with south facing wall allowing thermal air currents to feed into living area of house. The idea of ISBU, SIPS and S.B. is born from going through the earth quakes in California, storms in Florida. I have respect for nature! Any ideas would be a real help! A: Your plan sounds quite reasonable to me; I see no reason why it shouldn't work. People used to claim that strawbale walls provide R-60 insulation, but this has been downgraded in recent years to more like R-30 to R-40, but that is still pretty good, especially for walls. Most heat escapes houses through their roofs, so if your SIP roof has high R-value, you should be fine with a single layer of strawbales on the walls. Be sure to allow the bale wall to breathe well on both side, leaving air channels between the ribs of the container. And use a breathable plaster on the bales, with no moisture barrier. Allow your roof to have large eaves to shed water away from the walls. All it should take are occasional ties between the container and bales to secure the wall, and this could be done in many ways, using threaded rod bolted all the way through, eyebolts and galvanized wire, etc. To find a local engineer, you might consult the various directories of green professionals listed partway down the home page on this site. Q: I have been wanting to build a strawbale home for some time. I have also researched other green and recycled material building options. Recently I saw some interesting shipping container homes. I can envision some exciting design possibilities combining the ultra contemporary/industrial feel of the shipping containers in contrast to the natural, earthy, soft look of strawbales. My question is, with limited interior space using shipping containers, can I use straw bales on the outside for insulation? If so, how do I address breathability? With the corrugated face of shipping containers creating gaps, will there be a problem with the chimney effect? If these two products can safely and effectively be used together, I would like to explore the possibilities. I am actually in favor of recycling used containers for housing, and have written an article about doing this. Insulating a container with strawbales on the outside seems like a good idea to me. As with any strawbale structure, the bales would need a good raised foundation (could be earthbags) and a good overhanging roof. The other important consideration is that the bales need to be able to breathe, so air circulation behind the bales is good and a breathable plaster is necessary. The fact that the container is air tight is actually good, in that moisture laden air from inside will not affect the bales.